DWT conveyor belt dryer is used for drying sheet type, strip type and granular materials in food, medical, chemical, building materials, electronics as well as other industries. The series belt drying machines are particularly suitable for the materials with high moisture content and low temperature, such as dehydrated vegetables and Chinese herbal pieces. DWC multilayer belt dryer is specially designed for drying different shapes of root vegetables and leafy vegetables. This drying machine has three-layer and five-layer structure, each layer can be independently adjusted the drying temperature according to the characteristics of the materials. Belt dryers are continuous drying equipment used for drying the materials with good air permeability like sheets, strips, granulars and some pastes. This drying machine is designed for drying dehydrated vegetables and Chinese herbal pieces with high moisture content as well as heat sensitive materials. Conveyor dryer is mainly used for drying small pieces of materials and fiber materials in industry. 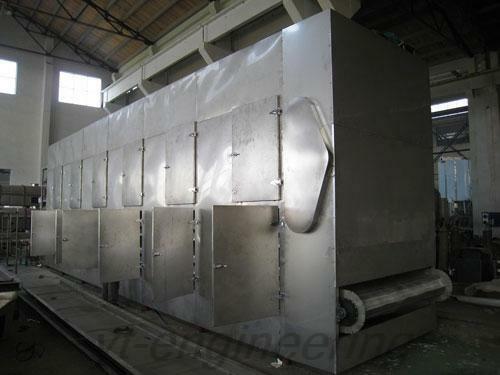 1.Belt dryers have advantages of high drying rate, high evaporation intensity and excellent quality. 2.The materials dried by conveyor dryer must have a certain shape, and the shapes can be still kept after drying. Belt dryers are designed for the especially thermal treatment of products. The wet products are continuously and evenly applied through an infeed chamber onto a perforated belt. The belt conveys the products through the drying area. In the cells, the wet products are dried by the drying gas. Each cell can adopt a ventilating fan and a heat exchanger. It allows the drying and cooling temperatures to be controlled separately in the different sections. Thus, each conveyor dryer cell can be separately controlled. Additionally, the drying or cooling air flow can be varied in each cell. The speed of the conveyor belt can be varied what gives an additional parameter for setting of drying time. The cells can be heated or cooled directly or indirectly. The heating media like oil, steam, hot water or hot gas can be used. How to choose a belt dryer? Belt drying machine has a wide using range, and it has been used in pharmaceutical, food, biological, chemical and other industries. But it has different selection standard in each filed. This is because the requirements and parameters of dried materials in each field have big difference. Therefore, the model selection standards are extremely complex, you should be cautious when you choose the conveyor dryer. 1.If the belt dryer is used in the pharmaceutical industry (especially traditional Chinese medicine), the users should pay attention to the following aspects. The drying temperature and smelting point should be accurately controlled. The control area of vacuum degree should comply with the heating temperature at different stages. The drying machine must possess on-line automatic adjustment function. The detecting system should be improved as much as possible to meet the pharmaceutical GMP standards. 2.The belt dryer for food industry should consider the solid content of the materials, output requirements, specific volume and appearance of the product. Two factors cannot be ignored when choosing food-grade vacuum conveyor dryer. One is consumption ratio per energy unit, the other is the support equipment like preceding delivery of raw material, product fine crushing after drying and packaging. Founded in 2000, Jiangsu Yutong Drying Engineering Co.,Ltd. is a professional drying machine manufacturer and supplier in China. Our main products include spray dryer, pressure spray dryer, belt dryer, centrifugal spray dryer, mixing machine, granulating machine, grinding machine and other drying equipment. Conveyor dryer as well as other machines must undergo a trial run in the workshop, and only those qualified products are allowed to leave our factory. If you need more information about belt dryers, please feel free to contact us.